Hiroki Ito, Naoya Osawa (2018) A field study of the colony composition of the wood-feeding cockroach Panesthia angustipennis spadica (Blattodea: Blaberidae). Applied Entomology and Zoology. Yuki Tsujii, Kanehiro Kitayama (2018) Relationships of phosphorus concentration in reproductive organs with soil phosphorus availability for tropical rain-forest trees on Mount Kinabaru, Borneo. Journal of Tropical Ecology. Keito Kobayashi, Kanehiro Kitayama, Yusuke Onoda (2018) A simple method to estimate the rate of the bamboo expansion based on one-time measurement of spatial distribution of culms. Ecological Research. Agus Sudibyo Jati, Hiromitsu Samejima, Shogoro Fujiki, Yuyun Kurniawan, Ryota Aoyagi and Kanehiro Kitayama (2018) Effect of logging on wildlife communities in certified tropical rainforests in East Kalimantan, Indonesia. Forest Ecology and Management. 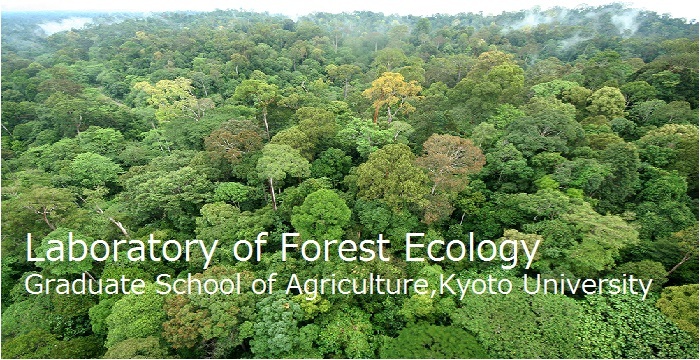 Copyright © 2011 Laboratory of Forest Ecology, Kyoto univ. All Rights Reserved.